It is 34 degrees in Chicago, and Jonathan Wildt looks out the windows of SSA's Mies building as the snow softly floats down, "It's so cold here," he says, "it was 110 degrees in Khartoum." Wildt is back in town from his work in Sudan for a few days to meet with students, thank donors, and catch up with friends and family. He's relaxing before giving a talk to SSA's International Social Welfare Group, a student group that he was involved with when he attended the School before graduation in 2007. As SSA students settle into the classroom, Wildt gives everyone a friendly welcome. Some of the students seem a bit shy, yet as Wildt tells his story of how he has spent the last two years working on and off in the province of Darfur, Sudan, and in the capital, Khartoum, they move forward in their seats. At the end, they are eager to ask questions about how he found his career path in international aid. Wildt started at SSA in the clinical track, with an interest in healthcare and international aid work. But by the end of his first year, he became increasingly interested in health policy and switched to the administrative track and the Graduate Program in Health Administration and Policy. 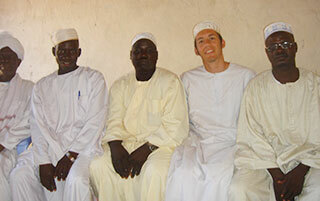 While there, he was fortunate to network with a missionary who was working in Africa and who put him in touch with the Educational Development Organization of Sudan (EDOOS), a non-government organization entirely managed by Sudanese that was launched in 2005 to bring education to the country's poor and marginalized. EDOOS offered Wildt a summer position; and for six weeks he did administrative work in Khartoum, where about half of the 11 million residents are displaced from the providences of Equatoria and, more recently, Darfur. Although the civil war has ended, the fighting continues sporadically throughout the country. Yet the Sudanese are trying to find a sense of normalcy, and building institutions for a functioning civil society is a priority. After returning to the States, Wildt had a clearer picture of what he wanted to do with his career. He opted for a second year placement with the Marjorie Kovler Center for the Treatment of Survivors of Torture, where he did grant-writing and fundraising. He also submitted a proposal to the newly established University of Chicago Darfur Action and Education Fund, which supports understanding of the conflict in Sudan and creative and entrepreneurial solutions by faculty and students. The University awarded Wildt a grant for his proposal: the Darfur Education and Community Participation Project, a collaboration between EDOOS and Sudan's Ministry of Education to build and open a community school in the Dereig Displacement Camp near Nyala, which would be operated by EDOOS. 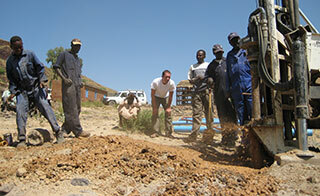 After graduation, Wildt quickly left for Sudan to launch the project. He has served as an advisor to EDOOS, helping to set goals, find consensus, and keep the project moving forward. For example, when community leaders were unhappy with a choice of brick for the building, he worked with all involved to find a way to simultaneously keep to a budget, incorporate the input, and stay on a timetable. The school opened in 200, initially serving about 100 children in grades 1 through 3. It's proven to be very popular and enrollment has grown to 270, with an ultimate goal to serve students through the 8th grade. Wildt says the hope is that they'll get additional funding to offer scholarships so that the children will continue on to a city school. The school also houses a community center—which has raised some eyebrows with local security forces who are wary about any kind of public gathering for fear of organized rebellion. Trust also took a while to build with the Ministry of Education, but Wildt says that now it is supportive of the new school. Currently the school primarily uses the ministry's curriculum, for instance, but they have been reviewing a curriculum that Jonathan and his colleagues developed for the school based on a Swedish model. In the spirit of community schooling, EDOOS does more than simply concentrate on education. Part of their success is dependent on having children who are healthy enough to attend school. Wildt has received a second round of funding from the Darfur Action and Education Fund to build 300 water bio-sand filters over the next year to supply cleaner water to 8,000 local residents. EDOOS will train 15 men and give them the equipment to build and sell the filters. Wildt strongly believes in this empowerment-based approach, training locals to build and sustain services for their communities. Not only do these "ground-up" techniques allow the community to take ownership of the projects, in an environment where aid workers are sometimes accused of siding with rebels, they're also practical. "Locals are more effective at moving filters into the marketplace than NGOs, who are often not allowed to move supplies, fuel, or any type of resource that could be taken by rebels and used against the government," he says. Wildt believes that the success of international aid requires a combination of empowerment-based approaches and the top-down methods often used by large aid organizations. The large NGOs are important to provide economies of scale for service provision and supplies, and they can often exert influence on diplomats and governments. But he has also found that they can overlook the micro dimensions of the problems facing distressed communities. "Sometimes they do not understand the importance of involving the community," Wildt says. This is where Wildt's social work training comes heavily into play. He gives an example of how a large NGO tried to introduce soap to a community without first consulting the elders. The elders were not convinced, and so the community members weren't convinced, and the intervention was a failure. He points out that a social work strategy would be to try to understand the person in context and recognize and respect the culture and community dynamics. He says EDOOS has been successful by utilizing a community organizing approach, allowing change to develop organically, and communicating through traditional Sudanese channels. "Because there is such wide-scale need here, perhaps some [NGOs] don't have the time and resources to use a bottom up approach. In many cases, however, I think that very few actually have that [social work] perspective embedded in their intervention methodology. Donor-driven interventions dominate," Wildt says. Wildt has not met any other social workers in Sudan and he says he isn't aware of any social work training in the country's universities. He remains the only Westerner working for EDOOS, providing sorely needed English language, finance, and nonprofit management skills. "It's unusual for an expatriate to work in a Sudanese-led organization," he says. "Many NGOs and nonprofits are managed by people and entities that are not Sudanese or are organized outside of the country." Aside from being a lone social worker, Wildt has faced other challenges, including learning Arabic. After a sixweek crash course in Cairo, he returned to Sudan realizing that it would take a much longer time to become conversational, let alone fluent. "My Sudanese friends laughed at my 'funny Egyptian accent,'" he says, "but they have been gracious and happy to help me learn their language and local dialect." He also has had to leave the country twice due to insufficient documentation over the course of the last two years. But with a new visa sponsored by a larger organization, International Aid Services (IAS), he now knows that he can stay and work until 2010. Wildt says he has enjoyed his time in Sudan and has relied on his faith to get him through some of the tougher moments. And he says that he's been lucky—by initially signing on with a smaller organization, he's had the chance to "be his own boss" and learn about international development at a very quick pace. He says that the overall experience of being at SSA helped—he cites "Financial Management for Nonprofit Organizations" as the most valuable class that he took at the School—but that nothing can prepare a student for encounters with humanitarian crisis and mass economic upheaval. Wildt is modest, giving most of the credit for the successes to his Sudanese colleagues and those that have financed the work, including the University of Chicago and smaller groups such as the Black Student Association (BSA) at the University of Chicago Lab Schools, which raised almost $3,000 for the water filtration project. It gives him enormous satisfaction to be able to spend a week in Chicago with Lab students and then the next with the very people in Sudan who will benefit. "I can see a direct correlation between the givers and the beneficiaries," he says. Wildt admits he sometimes misses home, but he says he is "very happy with his work" and maintains his strength through his faith and through the positive energy of the people around him. And his perception and understanding of the country and situation has evolved. As he describes it, many Westerners have an image of Sudan as a country rocked by genocide due to ethnic conflict, and though that has been and too often still is true, the country is also now trying to move forward and people are concentrating on their daily lives. Although his job is in an administrative capacity, Wildt works in the camps and often finds himself in what would be described as clinical situations. His Sudanese colleagues have all been affected by displacement, and their resilience has made a huge impression on him. He speaks of friends who have witnessed and experienced horrible atrocities, but who are in school and are planning for a brighter future for their country. "Sudan simply doesn't have the capacity to deal with some of its largest needs, and laws are still made in the streets," Wildt says. "But I'm optimistic, and I like to think the work I do is part of a better future. At one time Darfurians who had no access to education, now do." For more information about the University of Chicago Darfur Action and Education Fund, please contact Keith Madderom.